For a historic tour of Old Town Strasbourg, follow this route over cobblestone streets, bridges, and architecturally significant plazas. Start out on Grand Rue near the St. Pierre church. The narrow cobblestone street is mostly closed to cars, and it’s a fun spot to take in the atmosphere of Strasbourg’s cafe spotted downtown. Head south on Quai Turckheim to Ponts Couverts. This will carry you over the canal to the old Alsatian neighborhood of Quartier des Tanneurs (La Petite France), which is known for its bridges and half timbered houses along the water. Follow Quai de la Petite France east along the canal, then turn right onto Rue des Moulins. Then, cross the Pont Saint Martin and head east towards Place St. Thomas. You’ll pass by the impressive Gothic church before dropping back to the edge of the canal. The waterside path will take you east to Rue de la Douane. 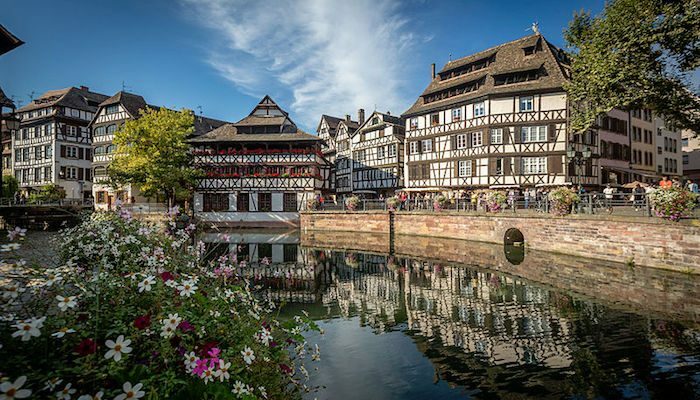 Where Douane meets Rue du Vieux Marché aux Poissons, you’ll see the Historical Museum of the City of Strasbourg. This block is chock full of Strasbourg tourist destinations and photo ops. Continue east towards the Rohan Palace, and enjoy the sites of the Grande Boucherie and the Suckling Pig Market Place. Finally, turn north onto Rue du Bain aux Roses, to arrive at the stunning plaza of the Cathédrale Notre Dame Strasbourg, which includes the Maison Kammerzell, archeology, and art museums. Exit the plaza via Place Gutenberg, and return back on Grand Rue. This route is less than two miles, but can be combined with other routes for more distance. Add-Ons: Head south along the water’s east side to the Barrage Vauban (bridge), the University, the Strasbourg Central Mosque, and cross over the pedestrian bridge near the Mosque and head back north. Adds about 1 mile. Or, create your own additional route in the streets of the Old Town.